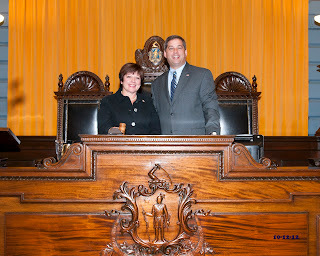 On Tuesday, October 9th, Selectman Mary Anne Nay of Boxford stopped by my State House office. Her visit provided us with the opportunity to discuss a number of issues relating to Boxford, and the condition of our state budget, I was able to bring her into the Senate Chamber for a photo. I welcome all of my constituents to come to the State House for a visit. The State House offers free tours year round from 10:00 am to 4:00 pm, and last approximately 40 minutes. To reserve a tour please call the tour desk at (617) 727-3676. The State House is rich with portraits and historical artifacts of Massachusetts' long and storied history.